I made some similar ones and got much use out of them while playing skirmish games. Now we're mostly playing DBA and HOTT and need to keep those nice units all in neat lines and such and so they're not so useful. I was thinking of doing some of those trees on washer bases so they could be moved around within the woods area - to make way for multi-based units. Thanks. 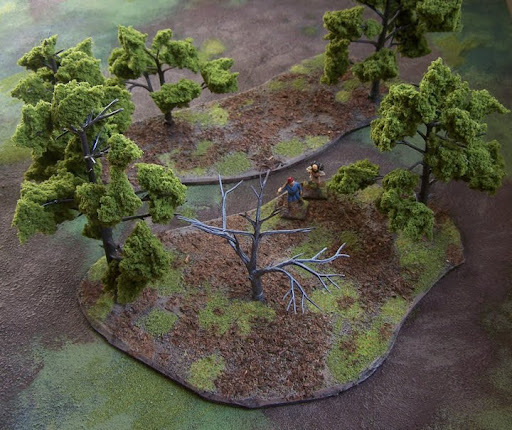 Yes, these trees would work best with individual models, rather than large movement trays. Did you see the trees on Cursed Treasures? I put a link at the bottom of this post. He mounted the trees to metal washers, and placed magnets on the forest. I want to try the same thing. Nice trees I like the way you used Tea leaves as leaf litter. I also like the way you collect the less known characters like the wood cutters, nice work. Thank you, Mr. MItten! I have been collecting interesting individuals like these woodsmen for a while. Old Glory and MegaMiniatures mostly. I keep trying to get Citadel's old villagers on eBay, but there are always alot of competing bids for those. I'll soon be painting villagers for a tavern I am building. I'm hoping my 7-yr-old daughter will like to play since it will be so much like a doll house. I really do love these trees. 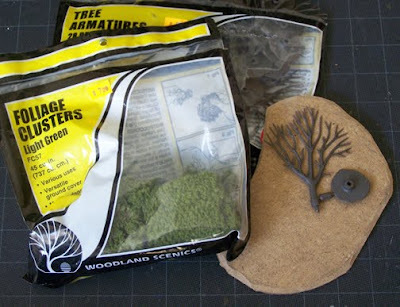 I may have to go back to my old tree bases and dress them up a bit with some tea leaves. I really kick myself for having sold off all my GW commoners. I had a few but most of them seemed to medieval for the projects I was working on. Watch out, the tea leaves do tend to flake off a bit. I'm thinking of brushing white glue over some spots. Wow, 17th cen. villagers! I did not know Warlord had those. And I even looked through that range for possible Mass. 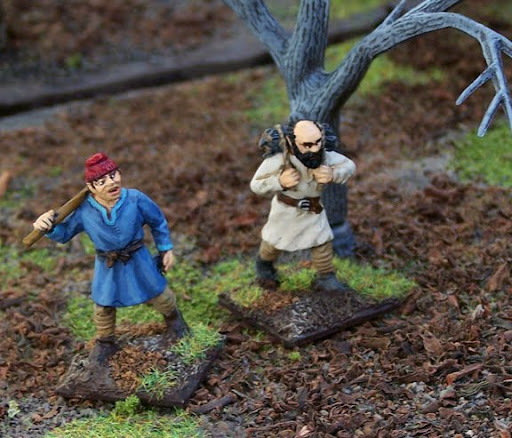 militia men. I want those!